Remember Kate and Zach who were married at the Mansion on September 25th? 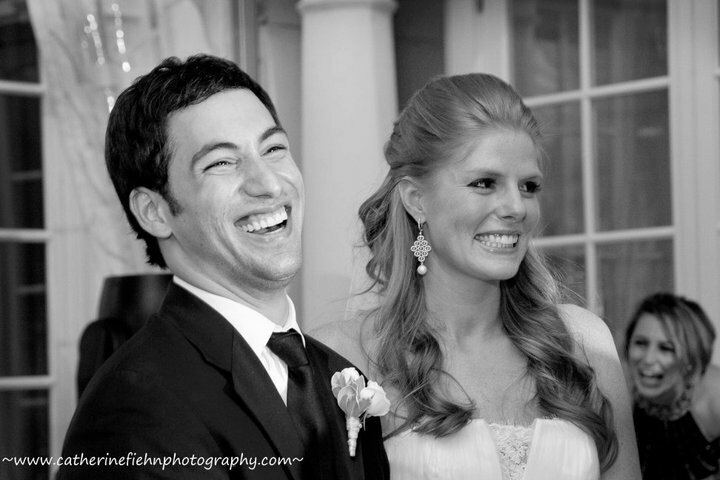 Kate and Zach met in the Fall of 2002 through mutual friends at Boston University during Kate's Freshman Year. Zach was a sophomore. They were in love ever since! Zach operates ZZ Imports with his father and is president of Heirloom Rugs so when Zach told told Kate that he had a work appointment in Nantucket she thought nothing of it. They decided to spend Friday at Kate's parent's house in Noank. Early in the morning while Kate was still asleep, Zach asked Kate's parents for her hand in marriage. That morning Kate and Zach stopped at their favorite place, Mystic Market to pick up snacks for the ferry ride to Nantucket. When they were about halfway to Nantucket while passing through Newport, they received a call from Zach's mother that the "appointment" was cancelled. They decided to spend the day in Newport anyway, which at the time Kate thought was her idea. In reality Zach had the whole day planned. Zach suggested that they have a picnic at the park on the water with the food they packed for the boat. Zach pulled out the antique Persian rug that was supposedly for the "appointment" and they used it as their blanket. Since Kate worked for Perrier Jouet they had packed some champagne. In the middle of their feast in the park Kate still had no idea that Zach was going to propose. Zach then got down on one knee and popped the question and she said YES. He had planned the whole weekend in Newport, a private boat ride, amazing dinner and a bed and breakfast. Kate said: "When planning our wedding we wanted something classic and timeless that we could look back at our pictures and smile. From the first moment we saw the Wadsworth Mansion we knew it was exactly what we wanted. It brought back memories from our engagement as it looked like the gilded age mansions of Newport. We used the antique theme throughout our wedding from the 50 foot Persian runner to the antique candelabras." The marriage was officiated by Justic of the Peace Chaz Zezulka of Mystic who was Kate's sixth grade teacher. Kate wore an ivory lace Pronovias gown designed by Manuel Mota embellished with her grandmother's heirloom pearl and diamond broach. Kate and Zach celebrated their honeymoon in Bali and Singapore. Thanks for sharing your story with us! To view additional photos from our write-up of Kate and Zach's wedding in September, click here.